One of the best investments that you can ever make is on an electric saw. Compared to the traditional saws, power saws will help you work much faster and with great precision using the least effort. In those reviews, we look at some of the best electric saws and several features that make them stand out. It comes with dimensions of 17.1 x 8 x 5.5 inches with a weight of 5.75 pounds. It is a corded electric power saw and is powered by 120 volts. It is fitted with a 3.4 Amp 4,600 SPM motor. It comes with a variable speed button. It comes with a large capacity blade and a metal cutting blade. Its power cord is 6 foot long. This electric saw comes with a very powerful motor that you can use on just any task with great efficiency. You get a heavy duty blade and metal cutting blade to ensure that you can use it on wood, metal, and even plastic. Hand strain is limited by the fact that it comes with an ergonomic handle that makes it very comfortable to work with. It is also energy saving, however, it is corded electric and that means you can only use it in places close to a power source unless you are using a power extension. You are free from hand strain in case you will be working for long hours since its handle is made with an ergonomic handle. It is lightweight and compact to ensure ease of movement. You get a free storage bag to carry all its components for ease of movement. 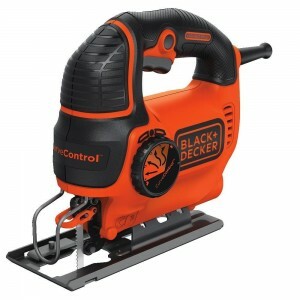 It has a powerful motor that will ensure you complete projects fast and efficiently. You can use it to cut through plastic, wood and metal thanks to its powerful blades. It comes with a long enough cord that allows for ease of movement while working. You can only use it close to a power source so in case you need to use it externally you will need to get power extension equipment. It comes with dimensions of 14.6 x 19.7 x 8.1 inches with a weight of 11 pounds. It is corded- electric and needs 120 volts to operate. It is fitted with a 14.5 Amp motor. It comes with a side handle and a rear handle with rubber grips. It comes with an auto-tension chain system. It has an internal oil reservoir with oil level indicators. It comes with a built-in chain brake lock. 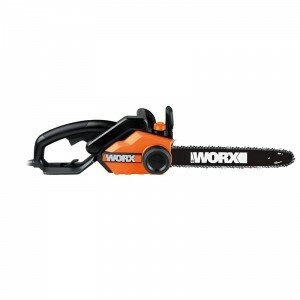 You will love this chainsaw not only because it is very efficient thanks to its powerful motor but because it is also very easy to maintain. 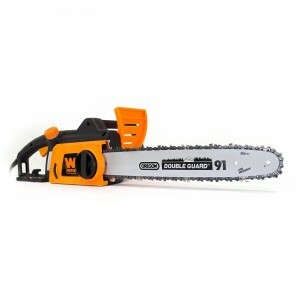 It comes with an inbuilt oil reservoir that lubricates the chain saw automatically and is connected to an oil level indicator to notify you when a refill is necessary. Unlike other chainsaws, it has an auto-tension system that ensures that you always work with the right tension. It also protects you from kickbacks using an inbuilt brake system. However, it is corded electric which means you always have to use it close to a power source. 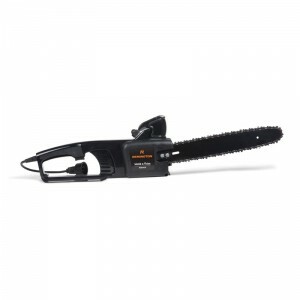 It has an auto tension system that ensures the chainsaw always operates at the right tension. You will find it very easy to control since it is lightweight and quite compact. It has a powerful motor that will ensure you complete every job fast and with consistency. You will have more control and less hand strain while using it thanks to its ergonomic rear handle and side handle. It protects you form kickbacks thanks to its built-in brake locks. You will spend less time maintaining it since it auto-lubricates. Its oil level indicators will notify you when the oil reservoir is running low. It is corded electric so you will need a power extension device in case you are using it far from a power source. It comes with dimensions of 11.8 x 4.4 x 9.2 inches with a weight of 5.2 pounds. It has an ergonomic handle with rubbers grips. It comes with wire guard. It’s corded electric and powered using 120 volts of electricity. It is fitted with 5 Amp, 3,000SPM motor. It is fitted with a keyless blade clamp. It comes with a beveling shoe. It is fitted with curve control technology. This electric saw is your best bet in case you want to complete your projects with accuracy and consistency. It is fitted with a beveling shoe that will ensure that you can make 45-degree bevel cuts effortlessly. You can also make precise curves with it thanks to its top-notch curve technology. Changing blades is fast since its keyless blade clamp does not need the use of tools for that. Even though it comes with a powerful motor that you can use for different projects its trigger does not allow you to vary the speed on the go. Another issue is that you will need a power extension in case you intend to use it far from a power source. It comes with a powerful motor that ensures you complete your projects with efficiency and consistency. You can use it to make perfect curves and 45 degrees bevel cuts. It is lightweight and its fitted with an ergonomic handle for ease of control without hand strain. You do not need any tools to change the blades thanks to its keyless blade clamp. Its wire guard ensures that you can follow a line for precise cuts. You will spend less time maintaining it since it blows dust away from it to prevent internal accumulation. It is corded electric so you have to use it close to a power source. You cannot use its trigger to alternate the speeds. It comes with dimensions of 14 x 7 x 8 inches with a weight of 6.25 pounds. It is corded electric and is fitted with an 8 Amp electric motor. It is designed with a rear handle and a front handle with hand guard. It is fitted with a manual push button oiler. It is fitted with an external chain adjuster. It comes with a 14-inch low kickback bar. You will enjoy operating this electric saw since it is very lightweight and therefore very easy to control. It comes with two handles; while the rear one is ergonomic to limit hand strain the front side handle comes with a hand guard to protect your hands from debris. Oiling it is very easy since it is fitted with a push button that adds oils to the chain seamlessly. It is also designed with a 14 inch- low kick-bar, however, it would have been great if it was fitted with a brake system to cushion any kick bar occurrence. It is very lightweight and compact making it very easy to handle for long periods without strain. You only need to push a simple button to oil the chain so that it operates efficiently. Its front hand has a hand guard that protects your hands from flying debris. You can adjust the tension on the saw manually so that it cuts smoothly. It is fitted with a powerful motor that will ensure it works with consistency. You will love it that it does not make any noise. The bar the chain runs through is very strong to minimize kickbacks. It is corded electric so you will need a power extension in case you intend to use it far from a power source. It does not have a brake system to prevent kickbacks. It comes with dimensions of 15.1 x 4.2 x 5.8 inches with a weight of 6 pounds. It is corded electric and works with 120v for optimal performance. It is fitted with a 4 Amp motor. Its grip is fitted with a safety trigger. It comes with a parallel guide attachment. It is fitted with a depth gauge lever. It works with extra thin blades. 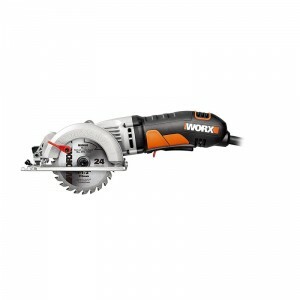 This circular electric saw is fitted works with very thin blades and a very powerful motor to ensure that it delivers very great speeds for a smooth finish. It comes with a parallel guide attachment that is useful in ensuring that you cut with precision. You are protected from potential accidents by its safety trigger that prevents the device from starting when you are not ready. You can also adjust it to cover different thickness and a variety of bevel angles. However, its housing is made of plastic which is not very durable in the long run and it needs a power extension to be used far from a power source. It is very lightweight which makes it very easy to handle and control. You are safe while using it since it comes with a safety trigger that can help prevent accidents. It comes with a powerful motor that will ensure you complete each job with speed and consistency. You can make precise straight line cuts thanks to the parallel guide attachment that it comes with. It can be adjusted to accommodate different bevel cutting angles. You can adjust its depth to accommodate woods with different thickness. It blades are extra thin but sturdy to ensure they cut with great speed. Its housing is made of plastic which is not that durable. You have to use it close to a power source since it is corded electric. It comes with dimensions of 16.6 x 5.5 x 3.6 inches with a weight of 3.35 pounds. It is powered by a 10.8V Li-ion battery with a charging time of 3 hours. It works with a motor speed 2,000 rpm. It has a safety switch. One great thing about this pruning saw is that it is cordless and so it saves you from the inconvenience of being limited to a power source or using an extension. 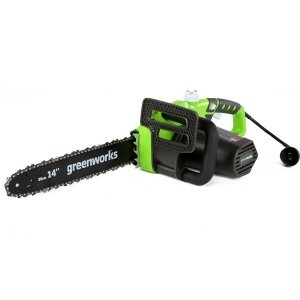 It is also fitted with a powerful motor that works great for branches of medium size. Apart from pruning, you can use it for cutting plastic and light metals. However, changing its blades is not an easy task and you cannot use it to effectively trim branches that have a thickness of more than 2 inches. You can use it cordless and it does not limit you to power source proximity. It has a powerful motor that works with great speed and consistency. You will not experience any hand strain while using it since its handle comes with an ergonomic design. It keeps you safe from accidental starts thanks to its safety switch. You can use it to cut wood, plastic, and metal. It comes with three different blades that you can use for different functions. Changing the blades is not quite easy. It does not work well for very big branches i.e. those above 2 inches. It comes with dimensions of 96.5 x 5.5 x 36 inches with a weight of 7.9 pounds. Its head can be adjusted to different angles between 0 – 30 degrees. It can be adjusted up to achieve 14 feet of overhead reach. It is fitted with an 8 Amp motor. It is fitted with a safety switch. 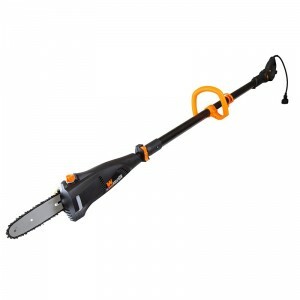 If you are looking for an electric saw that you can use for overhead pruning then this chains saw is perfect for you. 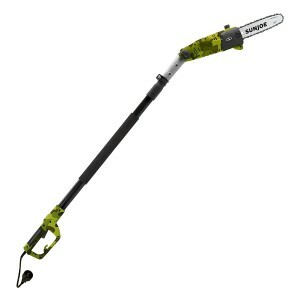 It can be elongated to reach a height of up to 14 feet for easy pruning and works well for both thin and branches with a thickness that is above 9.5 inches. You will also love that you can rotate its head to up to 30 degrees to cut the hard to reach branches. While not using it you can use the safety lock that prevents accidental starts. However, being a chain saw, it does not come with a clear mechanism that one can use to tighten the chain when it becomes loose. You can use it for both thin branches and thick branches of over 9.5 inches. It is electric so you do not have to deal with dangerous smoke and gases. You can reach the tallest of branches of up to 14 feet without the need to climb a ladder. It lubricates automatically to ensure the chain runs smoothly for consistent cuts. You can use it cut to even the most awkwardly positioned branches by adjusting its head. It protects you from accidental starts thanks its safety switch. It does not have a mechanism for adjusting the chain tension when it becomes loose. It comes with dimensions of 6.5 x 10 x 31 inches with a weight of 10 pounds. It works with a 12 AMP motor that has a speed of 44 feet per second. It comes with two handles; a main handle and a side-handle fitted with a hand guard. It is a corded electric chainsaw. It comes with a knob for tension adjustment. It is designed with an auto-oiling system. It comes with an extension cord wrangler. You can use this electric saw for both light tasks and the difficult ones thanks to its powerful 12Amp motor that is capable of cutting through 44 feet per second. It is also fitted with an auto oiling system to ensure that the chain runs smoothly for consistent cuts. After long use, you can adjust the tension on the chain using a knob on its head that is specifically meant for that purpose. In case you are using it far from the power source and you need to use a power extension, you have a cord wrangler that will help you to manage it to prevent unplugging. However, its one issue is that its housing is made of plastic which is not that durable. You will not have to deal with smoke and fumes since it is electric. It is lightweight for ease of control during use. Your hands are protected from flying debris thanks to the hand guard on its side handle. It has an oiling system that oils the chain automatically for a smooth operation. You can adjust the tension in the chain when it becomes loose. It has a cord wrangler that prevents the extension cord from being too taught and unplugging. You can switch blades quickly without the need for tools. It is not a cordless saw so you will need to use an extension cord with it. Its housing is made of plastic which is not very durable. It comes with dimensions of 29 x 9 x 7 inches with a weight of 8 pounds. It works with a 9 Amp motor. It is made of two handles; the main handle with rubber grips and a side handle with a guard. It comes with a chain tensioning knob. It is capable of auto-lubrication. It works with a 14-inch bar. It is fitted with a cord wrangler. 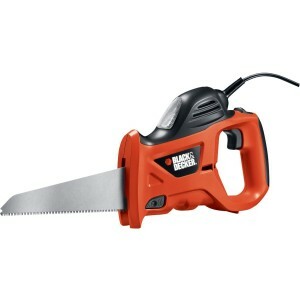 This power saw comes with a 14-inch bar that you can use to cut through a wood of up to 12 inches with great precision given it also comes with a very powerful 9 Amp motor. You will get to work with two handles which gives you great control over a range of movement. It has a knob that you can use to change the tension on the chain without the need of any tool. However, it lacks a mechanism that can prevent kickbacks which are common with chainsaws and there is no way of telling the level in the oil reservoir. It uses electricity so you are safe from smoke and dangerous fumes. You can trust its power motor to ensure it cuts through with speed and efficiency. It is lightweight and comes with two handles for easy control. Your hands are protected from flying debris since the side handle has a protective guard. Its front handle comes with rubber grips and an ergonomic design that protects you from hand strain after continuous use. You can adjust the tension without the need for any special tools. It auto-lubricates to ensure that the chain is running smoothly. It lacks a mechanism for preventing kickbacks. Its housing is made of plastic. It’s hard to tell the oil level in the oil reservoir. It comes with dimensions of 9 x 7.5 x 77 inches. It comes with a telescoping pole. It has an auto- lubrication system. It is designed with a chain tensioning system. Its head can be adjusted to fit different angles. You will love this telescoping power saw for its powerful motor and the ability to reach some of the most far-flung tree branches during pruning. It has the ability to auto-lubricate saving you a lot of time when it comes to maintenance. The tension on its chain can be adjusted without the need of any tool and you can adjust its head to different angles to ensure that you get to the hard to reach tree branches. It is a good electric saw although you will need a power extension cord to ensure that you can operate it far from a power source. You can adjust the tension on the chain to ensure consistency and efficiency in its operation. It is lightweight and comes with an ergonomic handle that makes it very easy to control when being handled. You can adjust its telescoping pole to up to nine feet to reach some of the highest branches. It is fitted with a very powerful motor that works with great consistency. You can prevent accidents from happening by turning on its safety switch. Its head can be adjusted to different angles to ensure you teach some of the most difficultly positioned branches. You get a shoulder strap which you can use for carrying it around. 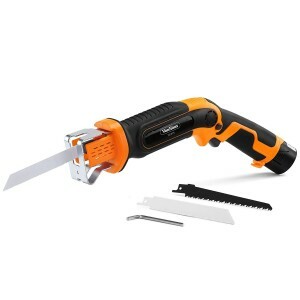 It is a corded electric power saw and so to use it far from a power source you will need to get an extension cord.